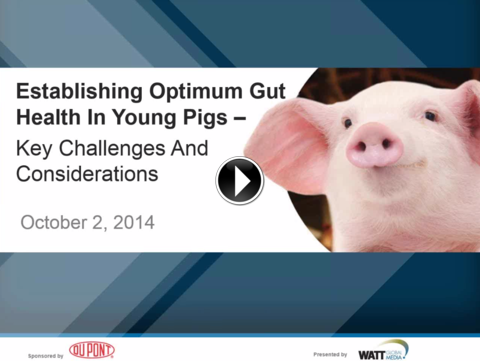 This webinar focuses on the key challenges and considerations in establishing optimum gut health in young pigs. Hear John Pluske of Murdoch University, Australia and our Global Development and Technical Director, Gary Partridge discuss key challenges and considerations in establishing optimum gut health in young pigs. Dr. John Pluske is currently the Australian-American Fulbright Commission Distinguished Chair in Agriculture and Life Sciences at Kansas State University, and a Professor at Murdoch University in Perth, Western Australia. He gained his qualifications at the University of Western Australia, graduating first with a Bachelor of Science (Agriculture) degree and then a PhD, the subject of which was ”Psychological and nutritional stress in pigs at weaning: Production parameters, the stress response, and histology and biochemistry of the small intestine”. He has since carried out post-doctoral studies on pig nutrition and health at the Department of Animal Science at the University of Alberta, Edmonton, Canada and the School of Veterinary Studies at Murdoch University, Western Australia. He has also worked at Massey University, Palmerston North, New Zealand, where he conducted research in pigs and chickens. John returned to Murdoch University in Perth in 1999 and has since worked in several senior roles in the School of Veterinary and Biomedical Sciences before assuming his current position. His current research is focussed on swine nutrition and the digestive physiology of pigs, particularly piglets and weanling pigs, and also swine immune function and controlling enteric diseases in pigs without antimicrobials. Dr. Gary Partridge joined Danisco Animal Nutrition, which is today part of DuPont Industrial Biosciences, in 1994 and is now the company’s Global Development and Technical Director, specializing in swine. Before joining Danisco Animal Nutrition, he worked as a senior researcher at the Rowett Institute in Aberdeen, Scotland and then as a technical swine specialist in a premix company in the UK that later became a part of Nutreco. Gary has penned numerous scientific peer-reviewed papers and abstracts over the years, as well as many trade press articles. He has also given many invited presentations on feed enzyme technology and betaine application in farm animal nutrition at seminars and conferences around the world. A member of the British Society of Animal Science and the Nutrition Society, he is co-editor of the textbook “Enzymes in Farm Animal Nutrition”.